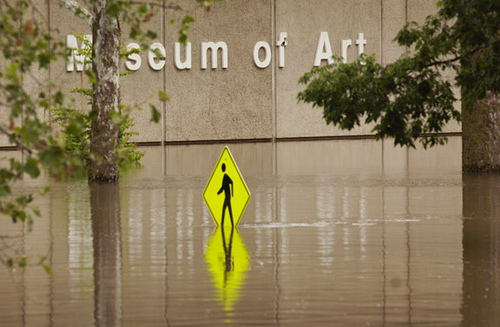 The UI Museum of Art has a disaster plan which was implemented last week. On a proactive basis the fine arts insurance company, Lloyds of London, has provided an emergency response team with fine art expertise. Three out-of-state conservators have been on-site preparing objects to be transported off campus as needed. Professional fine art packers and shippers are assisting museum and university staff. We have security staff on-site 24 hours a day. There has been no significant intrusion of water to the facilities. The U of I has set up a flood relief fund. “The Grant Wood Studio is fine and the situation at the Museum of Art is very much under control. The flood waters stopped several feet short of the Museum, but we received about 9 inches of water which backed up through drains in the basement of the Museum wing. By tonight (Sunday), all of that water should be pumped out. Water is being removed from the building and a team of conservators came in today to assess the damage. Also, they can’t use any volunteers at the moment. Minnesota museums seem to have made it through the flood just fine. I’ll keep you posted.